The Kinloch Castle is a castellated Tudor style castle located in the Kinloch village on the Isle of Rum off the west coast of Scotland. It was built by Sir George Bullough in the late 19th and early 20th century as a luxurious retreat. The castle, however, did not serve its purpose for long. The Scottish Natural Heritage that currently owns and manages the castle is trying to raise enough funds to carry out restoration which will prevent its deterioration and keep it open to visitors who are delighted by its splendour despite the fact that the effects of time and weather cannot be ignored. George Bullough inherited the Isle of Rum from his father, John Bullough who bought the island in 1888. The construction of the castle began in 1897 and in 1901, the castle appeared in its full grandeur. But as soon as it was completed, it became a temporary home to the wounded soldiers of the Boer War rather than to its owner. 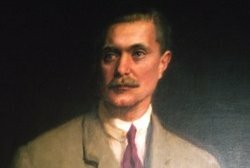 For lending his new luxurious mansion as well as his steam-yacht Rhouma to the British army, George Bullough was knighted by King Edward VII in 1901. As already mentioned earlier, Sir Bullough used the Kinloch Castle as a retreat but he also used it to host shooting parties which were attended by his friends. The interest in such activities among the high classes of society, however, declined during and after the First World War and thus the castle was less and less frequently visited by its owner. After his death in 1939, both the castle and the island passed to his widow Lady Monica who came there from time to time. Until 1957, when she decided to sell it to the Nature Conservancy (the predecessor of the Scottish Natural Heritage), the castle was in a state of neglect. The Nature Conservancy as well as the succeeding Scottish Natural Heritage tried to keep the castle in the best condition possible, however, the weather and time left a mark on the building. The Kinloch Castle urgently needs restoration to save it from further damage and to keep it open to visitors the number of which increased significantly after the castle’s appearance in the BBC Restoration series a few years ago. It made it to the finals but unfortunately, it did not win. It did, however, attract attention of the Prince of Wales’ Regeneration Trust which created a plan for the future development of the castle. 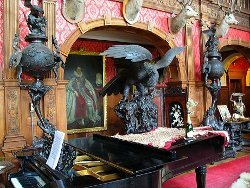 Unfortunately, the Scottish Natural Heritage and the Kinloch Castle Friends Association that was established in 1996 have not managed to raise the necessary funds to carry out the Regeneration Trust’s proposal although a number of restoration works have been carried out over the last few years. The Kinloch Castle is open to visitors as a museum as well as a hostel which is located in the former servants’ quarter. Guided tours take place daily during the summer season from early April to late October. They coincide with the ferries to the Isle of Rum but it is recommended to check with the Kinloch Castle reception before departing.